Governor Samuel Ortom of Benue State, has disclosed that, he would not seek for a re-election in 2019, until he heard from God, to do so. This was even as, he expressed optimism that, no one could stop him from becoming the executive Governor of Benue State in 2019, if God asked him to seek re-election. Apparently reacting to calls from youth groups and some stakeholders, asking him to contest for a second term, Governor Ortom said, whatever becomes of his ambition in 2019 was in the hand of God, adding that, it was God who asked him to contest in the first place. He said God had shown him a vision in 1992 that he was going to be a Governor in Benue State, which became manifested 23 years after. “I saw vision in 1992 and God asked me to go and become the Governor of Benue State. I attempted to become Governor in 2012 but it was not possible until in 2015 when God said it was time. “If God directs me that I should go for a second term, no one can stop me. But if God has not spoken, I won’t re-contest”, he said. He, however, described as “distraction”, the pressure from some quarters for his re-election, saying he was barely 2 years in office and the development of the state was his utmost priority. Talking about his achievements so far in 2 years in office, the Governor said, “one of the achievements of this government is that, we have been able to curb insecurity. “Before we came in, there were insecurity here and there – kidnapping, robbery, cultism and all that; but through our amnesty programme, over 900 criminals surrendered their weapons and we are now living in peace”. The Governor said, in addition to the plastic industry and cassava processing plants, his government also concession the Otukpo burnt brick to a foreign company, waiting their arrival; adding that, arrangements were also underway to revamp the Igumale Cement Company. On the implementation of the Anti Grazing and Anti Cultism Law recently passed by the State Assembly, Governor Ortom said, machineries were already in place to ensure herdsmen and others obey the law, vowing that those caught violating the law would be sanctioned. Ortom said, “there shall be special guards to support security agencies and the local vigilante group shall also support them”. He said, more cell facilities were being constructed at the Makurdi Prisons and as from November 2017, any one who breaks the law shall be thrown into the prison, after conviction. The Governor assured the herdsmen and those interested in ranching, that the state would provide land and adequate security for them, calling on the federal government to also give subsidy to help the ranching policy and encourage those participating in it. While answering questions on the recently flagged off yam exportation to Europe, the Governor said the initiative would provide job opportunities to teeming graduates in Benue, in areas of production, packaging and marketing. He allayed the fears that there would be shortage of food if the exportation continues, adding that, Benue currently contributes about 46% of total yam production in Nigeria and with the recent development, the production would increase to over 60%. 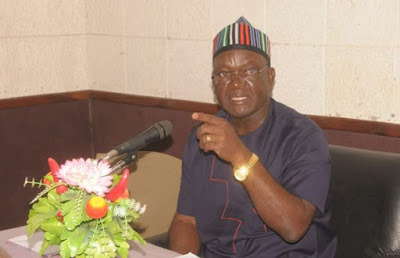 Ortom, in his response to the ongoing ASUU strike at the state owned university, said the government was already talking with the striking lecturers and that the industrial action would soon come to an end. The Governor, however, expressed displeasure over the conduct of the lecturers. According to him, “their grudge is about the 6 years accumulated allowances by the past administration. They were on strike before we came in, and we had to intervene before they resumed work”. He said, despite the meagre resources available to him, every month he coughs out the sum of N570m to the institution, whereas, Ebonyi State University gets only N200m from the government, while Nasarawa State University gets just N180m monthly from the state government. On the issue of non payment of salaries to workers in the state, the Governor said, he was able to control the payment, by paying one full month salary within two months, based on the understanding his government had with the various union groups in the state. Despite what he described as “shortfall in allocations and IGR”, the Governor said he was able to manage the payment of salaries so that workers won’t embark on strike. He said the government now owes local government workers 8 months and state workers 6 months.